Cardboard boxes are industrially prefabricated boxes, primarily used for packaging goods and materials and can also be recycled. Specialists in industry seldom use the term cardboard because it does not denote a specific material. The term cardboard may refer to a variety of heavy paper-like materials, including, card stock, corrugated fiberboard, or paperboard. The meaning of the term may depend on the locale, contents, construction, and personal choice. In business and industry, material producers, container manufacturers, packaging engineers, and standards organizations, try to use more specific terminology. There is still not complete and uniform usage. Often the term “cardboard” is avoided because it does not define any particular material. Paper is thin material mainly used for writing upon, printing upon, or for packaging. It is produced by pressing together moist fibers, typically cellulose pulp derived from wood, rags, or grasses, and drying them into flexible sheets. Paperboard, sometimes known as cardboard, is generally thicker (usually over 0.25 mm or 10 points) than paper. According to ISO standards, paperboard is a paper with a basis weight (grammage) above 224 g/m², but there are exceptions. Paperboard can be single- or multi-ply. Corrugated fiberboard sometimes known as corrugated board or corrugated cardboard, is a combined paper-based material consisting of a fluted corrugated medium and one or two flat liner boards. A shipping container made of corrugated fiberboard is sometimes called a "cardboard box", a "carton", or a "case". There are many options for corrugated box design. A folding carton made of paperboard is sometimes called a "cardboard box". 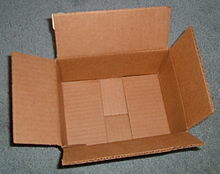 A set-up box is made of a non-bending grade of paperboard and is sometimes called a "cardboard box". 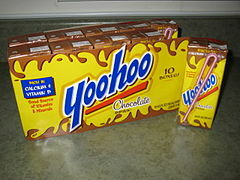 Drink boxes made of paperboard laminates, are sometimes called "cardboard boxes", "cartons", or "boxes". The first commercial paperboard (not corrugated) box is sometimes credited to the firm M. Treverton & Son in England in 1817. Cardboard box packaging was made the same year in Germany. The Scottish-born Robert Gair invented the pre-cut cardboard or paperboard box in 1890 – flat pieces manufactured in bulk that folded into boxes. Gair's invention came about as a result of an accident: he was a Brooklyn printer and paper-bag maker during the 1870s, and one day, while he was printing an order of seed bags, a metal ruler normally used to crease bags shifted in position and cut them. Gair discovered that by cutting and creasing in one operation he could make prefabricated paperboard boxes. Applying this idea to corrugated boxboard was a straightforward development when the material became available around the turn of the twentieth century. Cardboard boxes were developed in France about 1840 for transporting the Bombyx mori moth and its eggs by silk manufacturers, and for more than a century the manufacture of cardboard boxes was a major industry in the Valréas area. The advent of lightweight flaked cereals increased the use of cardboard boxes. The first to use cardboard boxes as cereal cartons was the Kellogg Company. Corrugated (also called pleated) paper was patented in England in 1856, and used as a liner for tall hats, but corrugated boxboard was not patented and used as a shipping material until 20 December 1871. The patent was issued to Albert Jones of New York City for single-sided (single-face) corrugated board. Jones used the corrugated board for wrapping bottles and glass lantern chimneys. The first machine for producing large quantities of corrugated board was built in 1874 by G. Smyth, and in the same year Oliver Long improved upon Jones's design by inventing corrugated board with liner sheets on both sides. This was corrugated cardboard as we know it today. The first corrugated cardboard box manufactured in the US was in 1895. By the early 1900s, wooden crates and boxes were being replaced by corrugated paper shipping cartons. By 1908, the terms "corrugated paper-board" and "corrugated cardboard" were both in use in the paper trade. Cardboard and other paper-based materials (paperboard, corrugated fiberboard, etc.) can have a post-primary life as a cheap material for the construction of a range of projects, among them being science experiments, children's toys, costumes, or insulative lining. Some children enjoy playing inside boxes. A common cliché is that, if presented with a large and expensive new toy, a child will quickly become bored with the toy and play with the box instead. Although this is usually said somewhat jokingly, children certainly enjoy playing with boxes, using their imagination to portray the box as an infinite variety of objects. One example of this in popular culture is from the comic strip Calvin and Hobbes, whose protagonist, Calvin, often imagined a cardboard box as a "transmogrifier", a "duplicator", or a time machine. So prevalent is the cardboard box's reputation as a plaything that in 2005 a cardboard box was added to the National Toy Hall of Fame in the US, one of very few non-brand-specific toys to be honoured with inclusion. As a result, a toy "house" (actually a log cabin) made from a large cardboard box was added to the Hall, housed at the Strong National Museum of Play in Rochester, New York. The Metal Gear series of stealth video games has a running gag involving a cardboard box as an in-game item, which can be used by the player to try to sneak through places without getting caught by enemy sentries. Living in a cardboard box is stereotypically associated with homelessness. However, in 2005, Melbourne architect Peter Ryan designed a house composed largely of cardboard. More common are small seatings or little tables made from corrugated cardboard. Merchandise displays made of cardboard are often found in self-service shops. Mass and viscosity of the enclosed air help together with the limited stiffness of boxes to absorb the energy of oncoming objects. In 2012, British stuntman Gary Connery safely landed via wingsuit without deploying his parachute, landing on a 3.6-metre (12 ft) high crushable "runway" (landing zone) built with thousands of cardboard boxes. Wikimedia Commons has media related to Cardboard boxes. ^ Soroka, W (2008). Illustrated Glossary of Packaging Terms. Institute of Packaging Professionals. p. 33. ISBN 1-930268-27-0. ^ Koning, J (1995). Corrugated Crossroads. TAPPI Press. p. 35. ISBN 0-89852-299-4. ^ "Glossary". School District Diversion Report 2000: Appendices. California Integrated Waste Management Board. ^ Frederick Le Gros Clark (1980). Growing old in a mechanized world: the human problem of a technical revolution. Ayer Publishing. p. 36. ISBN 978-0-405-12780-9. ^ What is Corrugated?. Fibre Box Association. ^ D996 Standard Terminology of Packaging, and Distribution Environments. ASTM International. 2004. ^ Alec Davis (1967). Package and Print: The Development of Container and Label Design. Clarkson N. Potter Inc. p. 62. ^ Marketing Communications, Volume 6, Issues 7-12, United Business Publications (1981). "Reportedly, the oldest known box-making business was formed in Great Britain about 1817." ^ Stanley Sacharow and Roger C. Griffin (1970), Food packaging: a guide for the supplier, processor, and distributor, AVI Pub. Co. "Commercial box making is supposed to have begun in England in 1817." ^ Paula Hook and Joe E. Heimlich. "Paper and paper products". A History of Packaging. Archived from the original on 2002-09-17. Retrieved 2005-10-26. The first commercial cardboard box was produced in England in 1817, more than two hundred years after the Chinese invented cardboard. ^ Chuck Groth (), Exploring Package Design, Cengage Learning. p. 7. "The oldest existing cardboard box package design was produced in Germany for a board game called 'The Game of Besieging,' in 1817. Still, paper and cardboard were relative luxuries." ^ Diana Twede and Susan E. M. Selke (2005). Cartons, crates and corrugated board: handbook of paper and wood packaging technology. DEStech Publications. pp. 41–42, 55–56. ISBN 978-1-932078-42-8. ^ "Valréas : ça cartonne !". lachezleswatts.com. Retrieved 4 April 2019. ^ "Le musée du Cartonnage et de l'Imprimerie à Valréas". Vaucluse le Départment. Retrieved 4 April 2019. ^ "Corrugated cardboard – packaging that has been used for almost 150 years". Farusa Packaging. Archived from the original on 2005-10-15. ^ "Hazeltine, Lake, and Co. ad". The World's Paper Trade Review. London. L (9): 19. August 28, 1908. ^ "Cardboard Box | National Toy Hall of Fame". Toyhalloffame.org. The Strong, The National Museum of Play. Retrieved 2014-03-07. ^ Stratton-Coulter, Danielle (2005-04-20). "When a cardboard box is 'home'". The Daily Iowan. Archived from the original on 2005-05-30. ^ O'Brien, Kerrie (2005-06-08). "Out of the box". Melbourne: The Age. ^ "Gary Connery: stuntman completes 2400ft skydive without a parachute". Telegraph.co.uk. Retrieved 2017-06-12.